The Tux Lux compliments the already established Tux range, with the addition of a feather and down wrapped seat cushion it adds softness to the design whilst retaining its formal lines. Construction: solid beech frame, sprung seat and deep buttoned back. CMHR foam seat cushions with a feather and down wrap. We recommend Moons Melton wool for this piece. Each Stuart Scott piece is built by hand in our workshop in Wiltshire, England. Nothing is mass-produced. This ensures complete attention to detail, structural integrity and sheer build quality. We never compromise. When we finish each piece, it is signed and numbered: a unique handmade masterpiece. Leg finishes: Oak - Oiled, Aged or Ebonised. Walnut - Oiled, Ebonised or Black Lacquered. 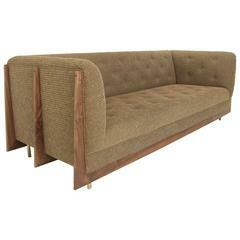 Brass - Solid Brass Legs carry an up-charge of £300.00 per sofa. Customers may also choose from the following metal finishes: Natural Brass, or *Bronzed Brass. *Bronzed Brass legs carry a further up-charge of £180.00 per set of legs. 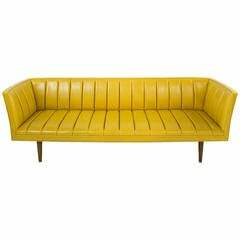 Exceptional green leather Italian style sofa that has been fully restored. This sofa has stunning brass legs and is an incredible piece of furniture. Jacob Kjaer sofa with 8 legs An elegant sofa with tight seat and back restored in a luxurious pale rose Prima Alpaca Fabric from Sandra Jordan. Denmark, circa 1950. Custom velvet settee with brass legs.